Titan Comics: HOME #1 Review | Warped Factor - Words in the Key of Geek. 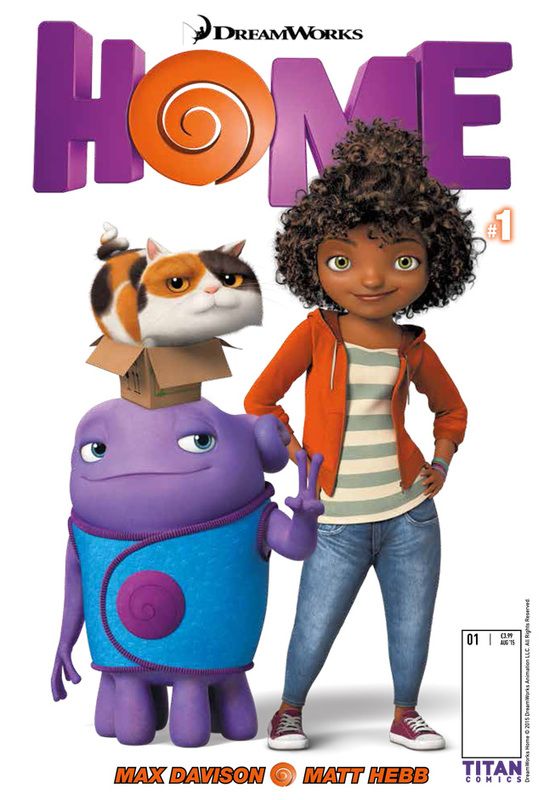 The premise of Home is almost intrinsically linked to its male lead, Jim Parsons, and his success as Sheldon Cooper in The Big Bang Theory. In TBBT Sheldon is a brilliant, but emotionally stunted and quite possibly (though no-one ever seems to mention this) autistic physicist, able to crack the secrets of the universe, but unable, say, to recognize sarcasm. In Home, the concept of Sheldon’s alienation is taken to its logical conclusion, and Parsons plays an adorable actual alien, who overthinks but has trouble with the human concept of emotions, and indeed with the concepts of humanity and individuality until he’s taught by example. It’s pretty much an animated ET with many more words and less initial heart. Oh and more alien invasion. And songs. Bringing Home to the comic-book world aims squarely at the movie’s younger audience, and in issue #1, Oh, the cute alien, is distinctly recognizable from the movie, out for fun and games, but overthinking everything, the concept of Hide and Seek is a potentially catastrophic one to introduce to the young literalist, especially when he happens to be able to get his Boov hands on a teleporter. Cue page after page of fun and fretting, as Oh tries to hide from his Earth-friend Tip, trading in the space under the dining table for the Egyptian Pyramids – and far, far beyond. It’s cute, it’s fun, it reeks of the original movie and the original characters, voiced by Parsons and Rihanna (did we mention the songs? Thankfully, we’re in a song-free environment here because of course, if you don’t actually have Rihanna, there’s little in the way of point), and what you end up with is a fifteen page fun read for the young geeklings. Max Davison and Matt Hebb conjure enough of the movie into both the concept and more definitely the artwork to make the young readers connect the comic-book with the movie and begin that journey that we all, as geeks, enjoy – extending our experience of the geekery we love beyond its original confines, exploring the life of the characters after the credits roll. There’s even, in this issue, a smaller sub-story by Martin Eden, and with art by Alex Dalton, which hammers home the characters really well – Tip telling jokes, Oh not understanding, but pretending to because it makes Tip happy. 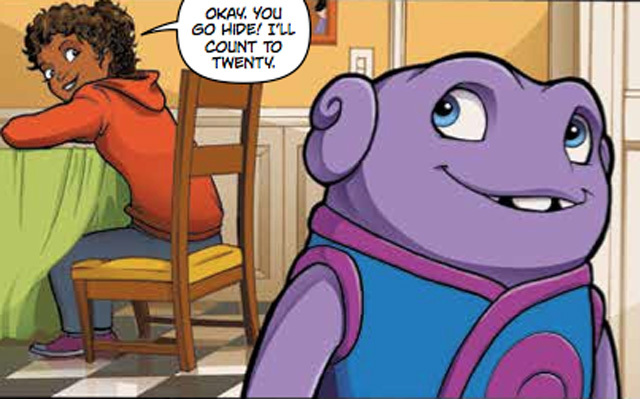 Get the geeklings in your life issue #1 of Home today, and as long as your teleporter doesn’t mysteriously disappear, there should be laughs till bedtime.